"Radium Pistols and Cathode Rifles"
P1: Turning from the window the three fugitives behold the palace guards racing toward them down the long corridor. P2: Waiting with mounts in the street far below, Sola, the green woman, again urges John Carter to hasten. P3: Placing his hand on Woola's ugly head, the Earthman orders the faithful beast to carry the girl down to the street. 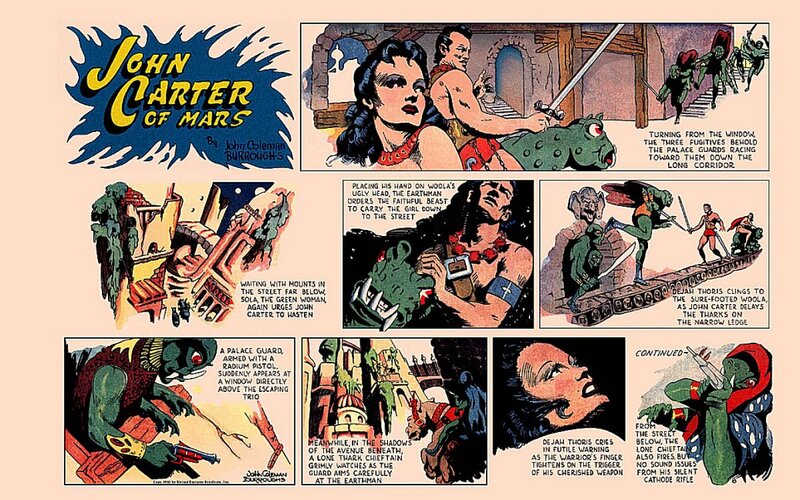 P4: Dejah Thoris clings to the sure-footed Woola, as John Carter delays the Tharks on the narrow ledge. P5: A palace guard, armed with a radium pistol, suddenly appears at the window directly above the escaping trio. P6: Meanwhile, in the shadows of the avenue beneath, a lone Thark chieftain grimly watches as the guard aims carefully at the Earthman. P7: Dejah Thoris cries in futile warning as the warrior's finger tightens on the trigger of his cherished weapon. P8: From the street below, the lone chieftain also fires, but no sound issues from his silent cathode rifle. 1. All of the story in Sunday pages #8 and #9 is a JCB innovation, not found in issue #35 of The Funnies, nor in the ERB original. It must be retained in the novelization, but the scenes in which Tars Tarkas is depicted killing the guard carrying the radium pistol need to be better integrated into the story. Tars Tarkas' intervention can be explained as being very secretive, and therefore not mentioned in the telling of the ERB original tale -- something Carter only learned about in later conversations with the taciturn Thark warrior. CHAPTER 8: "A Shot in the Dark"
From the days of her earliest memories Dejah Thoris had always felt most alive and electrified when in the face of grave danger. Barsoom is a dangerous place, of course, and her opportunities to feel that delicious thrill had not been meager. There had been a time, when her grandfather was yet Jed of Hastor, when the buoyancy tanks on his personal flyer had burst and the little craft spun down from the sky, out of control. She was only a hatchling then but she had understood the danger perfectly. Her mother held the babe in her protective arms, but little Dejah broke free and gazed on in wonder, as the ground seemed to be rushing up into the sky at her. The emergency containment balloon suddenly shot open, the diving craft slowed considerably and the crash was not one-tenth as bad as it could have been. The family survived. Little Dejah, sole heir to the the double star insignia of Tardos Mors, only cried when her mother said the esciting flyer ride was over. "A strange time to be thinking of my mother!" the princess said aloud, but the Jasoomian did not answer. There was something resembling a horizontal stone walkway attached to the palace wall outside of the window. What its original purpose might have been, John Carter could not imagine, but it was intricately carved and only offered a very unsure footing at best. It ran along several feet below the level of the window and it was only with the greatest difficulty that he managed to reach the narrow ledge, after having lowered Dejah Thoris down upon it by a strap from her own harness. A rare layer of clouds hid the later hour's starlight, but reflected back a dim glow from the bonfires kept burning all night at Thark's major street intersections. With only this faint light as a guide, the Earthman crept along the narrow shelf and waited for his eyes to become more accustomed to the dark. Then a heavy body dropped down from out of nowhere, right beside him! "Stand aside, you idiot!" shouted an officer among the palace guards in the throne room. He pushed down the swordsman who had chased Woola through the window, jumped up upon the giant's lower back and pulled his own lanky olive-skinned body over the window sill. His great bulging eyes scanned the darkness for any sign of movement. There was a rustling in the trees below, at some distance from the window. The officer repeatedly fired the radium pistol blindly at the sound. He instantly heard the distinctive squealing of a thoat in great pain. He fired again. The Earthman smelled the calot before he could see him. Then once again Woola nearly knocked John Carter from the precarious ledge. How the big creature managed to get around him, on a slippery stone path not quite so wide as his master's shoulders, the Virginia swordsman never understood. But by the time the green officer was firing the pistol, six feet above from the window, John Carter could make out the dim figures of Woola and Dejah Thoris, not far from him on the walkway. They were perfect targets for a Thark gunman! Owing to the peculiar design of the Martian firearm cartridges, they do not explode in a loud concussion when fired in the dark. The shots the officer had popped off sped silently down into the darkness, with a couple of the bullets pierced two living bodies, far below. It was purely blind luck but the green shooter did some serious damage to the creatures. Unfortunately for him the recipients of his barrage were the courtyard sentry who was chasin the speeding thoat through the blackness of the old arboretum, and the thoat itself! No sooner had the green officer hit the squealing thoat in the trees, then Captain Carter's calot began to rumble with the peculiar noise that passes for a warning growl among Martian watchdogs. Of course the growling gave away his position at once. A radium cartridge whistled past Woola's left ear, then another, even closer. The shooter in the window had not yet seen John Carter, below him in the dark, and the Earthman knew he had but a second to act. With his short sword belt and scabbard fully extended, Carter whipped the belt assembly up into the space above his head and the metal scabbard clanked against the ersite windowsill, setting off a shower of sparks in the night. A split-second later the shooter plunged from the window to the ground with a wail of pain. Then again all was quiet. "My God! what a lucky hit!" cried the bronzed swordsman, but somehow he knew that the officer had not fallen from the window as a result of the noisy scabbard. Something inexplicable had just occurred and the Earthman did not have time to ponder the sudden salvation. Facing outward from the wall he looked down and saw the dim outline of a lithe figure, mounted on a restless thoat, sixty feet below. Beside the rider and mount was a second steed with an empty saddle. Fifteen feet to his left, on the narrow ledge, crouched Dejah Thoris, short sword in hand, with the calot in front of her. Then John Carter glanced to his left. Twice that distance away, just emerging from the coal black shadows, were three more Thark swordsmen! The Princess of Helium glanced once again at the courtyard so far off, under her feet. She measured the distance in her mind and tried to conceive of some way to reach the ground without critical injury. Surely Woola could jump that far safely. Perhaps, if she hung onto his back and he leaped off the ledge -- no, not in the dark. She surely would knocked off the beast. If her luck was bad, she might even land under his heavy body. There must be another way. "John Carter! Can you jump down there with me in your --- Oh! look out!" A pistol discharged directly above his head, sending its missile flying right through his wavy hair. A new marksman was in the window! Then, again, silence for many heartbeats. Strange as it may sound, it was not until many days after the night's ordeal had passed, that John Carter and Dejah Thoris put together enough small clues to guess what it was that had saved them, there in the shadows of Tal Hajus' palace. After two green men had met their deaths at the window, it became obvious to both the humans that some exterior force was knocking down the most threatening members of the guard, before they could use their deadly firearms effectively. The most obvious answer, that occurred simultaneously to both the swordsman and the princess, was that Sola was using John Carter's missing gun to eliminate the dangerous attackers. Probably that exchange of thoughts was the first telepathic interchange between the young woman and the man. Subsequently, however, they discovered that they were both wrong in making this logical guess. Although they could not see the source of their salvation, the two escapees were aware that the presence of Tal Hajus' warriors in the window above their heads had ceased to be so threatening. Soon, however, the whole area would be swarming with more Thark guardsmen. They had to reach the ground as quickly as possible. Once more the couple traded these common thoughts by the silent communication that so often passes between attuned minds on the red planet. "Courage, Princess!" John Carter said aloud. But one glance into her beautiful, flashing eyes told the gentleman from Virginia that there was no fear in her.